Predictive analytics has come of age as a core enterprise practice necessary to sustain competitive advantage. This technology enacts a wholly new phase of enterprise evolution by applying organizational learning, which empowers the business to grow by deploying a unique form of data-driven risk management across multiple fronts. 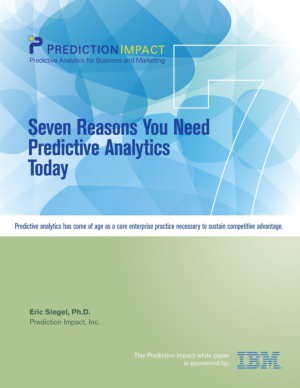 This white paper reveals seven strategic objectives that can be attained to their full potential only by employing predictive analytics, namely Compete, Grow, Enforce, Improve, Satisfy, Learn, and Act.